Puerto Rico offers so much for families looking for a beach getaway with cultural experiences. We drove through a rain forest, explored caves and visited plazas in Old San Juan and Ponce, which has preserved its Spanish colonial architecture. We couldn’t have picked a better location to spend Christmas on the beach. Going to Puerto Rico is like being in a different country within the United States and was a great way to introduce Spanish language and food to our preschool aged son. Without much research we decided to spend our December holiday soaking up the sun in Puerto Rico. Having spent a brief weekend there many years ago, my husband and I knew that we could count on great weather and beach access. Puerto Rico not only lived up to the relaxing beach experience we craved but also offered cultural and nature explorations that were ideal for families with young kids. Here are our top reasons for what made Puerto Rico a great family travel destination. Though Puerto Rico is located much further than other Caribbean islands like The Bahamas, Jamaica and Dominican Republic, you don’t need a passport to visit. The island has been a U.S. territory since the 1898 following the Spanish American War, when Spain ceded the island to the United States. My husband and I used our driver’s license for boarding and didn’t need to show any identification for our three year old son or seven month old daughter. Since access to the beach was a priority for us we booked a condo that was located on the Isla Verde beach in Carolina, about a 10 minute drive north of San Juan airport. This was a clean and family friendly beach that could be accessed by properties on the beach as well as through public entry points. The water was calm during daytime and the sand was ideal for building castles. Food vendors selling hot dogs, tacos and coconut water made it easy for us to spend Christmas day on the beach tasting local food. Luquillo located further east from San Juan is another popular beach town on the east coast. You can also take a ferry to Vieques and Culebra two islands belonging to Puerto Rico and known for its pristine beaches. Though they can make great day trips, advanced ferry reservations are definitely recommended when traveling with kids. The city center in the capital of Puerto Rico is a historic area that boasts of beautiful Spanish architecture from colonial era. We loved exploring this area during the day as well as at night to experience the change in atmosphere. During the day we strolled through cobble stone streets marveling at the colorful buildings with balconies made of ornamental wrought iron work, a signature of Spanish colonial architecture. The Spanish and Caribbean influence in buildings is evident with curves and arches and terracotta roof tiles along painted in vibrant island colors. Similar to European cities, Old San Juan area also consists of several plazas where visitors can admire statues, people watch while taking a break and have the kids chase pigeons. Plaza Colon and Plaza San Juan are two must see sights on your walking tour. Paseo de la Princesa is a lovely promenade that skirts the curved old city walls that is a scenic, leisurely walk. At night this area has a carnival feel with vendors selling food and crafts and salsa music in the background. Castillo San Felipe del Morro and Castillo San Cristóbal are two forts in the Old San Juan area that were built to defend the San Juan from seaborne enemies during the Spanish colonial era. Today they are part of the National Park Service managed historic site that showcases bastions, powder houses, walled fortifications. Though we didn’t tour either of these forts, we tried explaining the history and need for these forts to our three year old son. He especially loved the lawn area in front of Castillo San Felipe del Morro (known as El Morro) where he could run about and watch kites being flown. The lawn was a great place for us to relax and enjoy ice cream while taking in the spectacular view of the ocean and a historic burial ground with white tombstones from above. This is the only tropical rain forest in the United States and is easily accessible by car. The visitor center is great place to begin your tour with exhibits that introduces the indigenous flora and fauna. We didn’t attempt any trails with the kids and opted to drive through the forest roads. 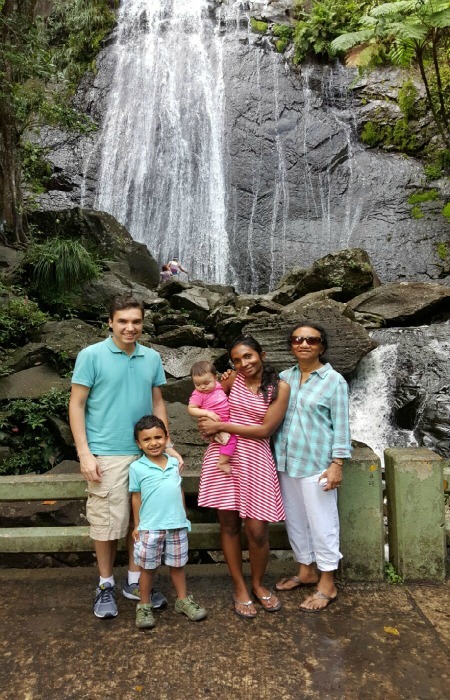 The Coca Falls was our first stop that is also a great photo op with the lush waterfall as our back drop. Next we drove to the Yakahu Observation Tower which gives a 360 degree view of the forest from the top. The stairs were easy to navigate for our son while the baby was in a carrier. This cave system which is part of a large network of natural limestone caves and underground waterways is carved out by the third-largest underground river in the world, the Río Camuy. Located in the middle of the island, they were discovered in 1958. The tour starts with a trolley ride through the tropical trees that takes you to the entrance of Clara Cave, the area developed for public viewing. The stalagmites and stalactites structures inside are natural works of art formed over thousands of years through mineral precipitation from river water. Beware of sleeping bats and their bird droppings as you make your way through the slippery ground. The second largest city in Puerto Rico is about an hour drive from San Juan. Plaza Las Delicias, the main plaza is surrounded by historic buildings. The fountains, sculptures of lions and Parque De Bombas, the red and black historic fire house, are attractions you can see on a walking tour. Since we made a day trip to Ponce, we had lunch at La Guancha , the boardwalk with cheap local eateries and a view of the marina. We also drove to Cruz del Vigia, a 100-foot-tall building of a cross where the arms of the structure offers panoramic views of the city through a glass enclosed overlook. There is also a beautiful Japanese garden at its base but the afternoon weather was too harsh for a peaceful stroll. We were disappointed to learn of the temporary closing of the The visitor center at Arecibo Observatory, known for housing the world’s largest radio telescope. Hence we made a trip to Dos Bocas Lake, a man-made lake located between the cities of Arecibo and Utuado. You can take a free ferry ride to a lakeside restaurant on the opposite end for a meal. There are about 5-6 restaurants and most will require advanced reservations. If not Restaurante Otoao where we dined, accommodated us after about an hour long wait. This was one of the few times where we didn’t see lot of foreign tourists during the busy holiday season as most visitors were local guests . Visiting the Arecibo light house park and the surrounding beach area are more activities if you plan on spending the day in this area. visited super markets for local fruits. We tasted a variety of mofongo, ceviche, paella along with desserts such as coconut ice and flan. After taking our son to Quebec this summer and seeing how interested he was in French culture, we knew Puerto Rico would serve as his introduction to Spanish culture. He was fascinated by the fast and almost lyrical tone among locals. He also noticed road signs in Spanish and quickly learned words such as pare (stop) and salida (exit). We were excited to see his enthusiasm for learning a new language in the future. We can’t wait to go back again, especially to the relaxing Isla Verde beach. Have you been to Puerto Rico? What was your favorite part about the island?